Welcome to the Shaolin Five Animal Kung Fu Store. 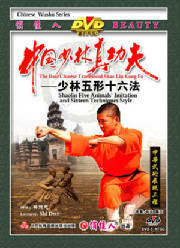 Here you will find instructional books and DVDs for the shaolin five animal system of kung fu. In the sprit of five animals, the movements of roosters, horses, and tigers are emphasized. Adopting the fighting techniques of the five animals-the peck of the rooster, the kick of the horse, the crouch of the tiger, the jump of the rabbit, and the twist of the dragon, created this style. Sixteen hand-Skills, step-skills and kick-skills were established basing on them .The change of the techniques is hidden in the coordination of the imitation. The movements are forceful, agile, and practical in combat. Click picture for more info. Brief Introduction: Tiger Boxing is a kind of animal-imitation boxing, which is powerful and abrupt, as if a tiger runs down a hill. The hands are always formed as tiger claws. Your will leads your Qi (internal energy) to the finger tops. Keep your hands, eyes, body and steps well coordinated. Move quickly. Your play should show the tiger's powerfulness. Click picture for more info and to buy. Dragon Fist belongs to the Shaolin 8 animal-imitation series. The animals usually imitated are rooster, sparrow, horse, buffalo, tiger, rabbit, snake, and dragon. In Chinese mythology, dragon is formlessly agile and changeable, and so this dragon-imitation hand form is characterized by changing movements. 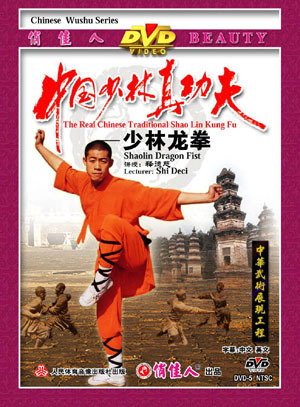 The book scrutinizes an old canonical form (the Tao) of the Southern Shaolin Kung Fu, the "Gung Gee Fook Fu". According to the legend, the founder of the Hung Gar Kung Fu style, Hung Tziguan studied this form under the tutorship of Southern Shaolin's best fighter, a Master of the Tiger Style Chzi Shan. The quintessence of Southern Shaolin Kung Fu School. 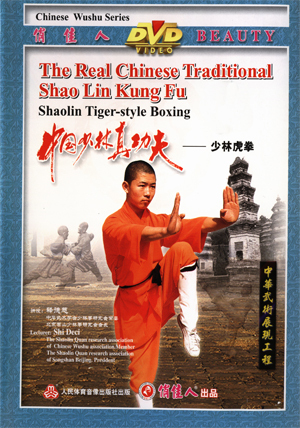 This TAO includes main basic techniques and fighting methods of Southern Shaolin Tiger Style, one of the most effective hand-to-hand system of Chinese Fighting Kung Fu. Click picture (top left) to download.